House Tully. Lady. The Seven. 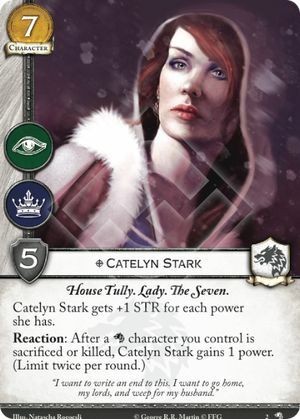 Catelyn Stark gets +1 STR for each power she has. "I want to write an end to this. I want to go home, my lords, and weep for my husband." Wolves of the North #2. Catelyn's triggering condition is the death of an individual Stark character, not the resolution of an effect that kills a character. So if a single effect (like Wildfire) kills multiple Stark characters you control, Catelyn would have multiple separate triggering conditions. She could react once to each triggering condition - - up to her limit of "twice per round" of course. Note that, since her ability is a reaction, Catelyn will have to survive Wildfire herself in your example in order to trigger her ability at all. Otherwise, she will be in the dead pile when it would be time to trigger reactions, and she can't use her ability from the dead pile.